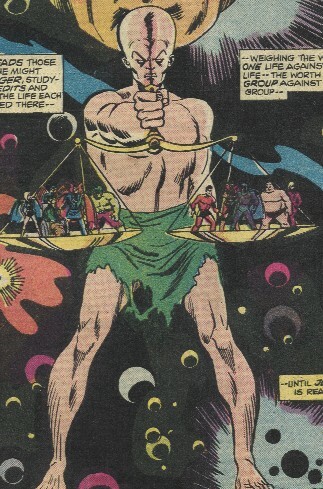 Powers/Abilities: Alpha possesses telepathy and vast energy powers, enabling him to transmute elements, restructure matter, reverse the aging process, project force fields, teleport himself and others, fly, survive in the vacuum of space, etc. 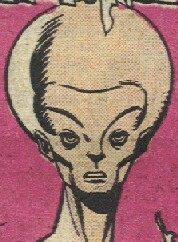 He has telekinetic powers, enabling him to lift a fifty story skyscraper and the surrounding land into the air. His powers are not without limits, and he is presumably less powerful than the Stranger. 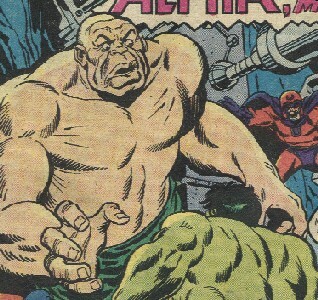 Initially, he had a hulking form, which likely possessed great strength. In that form, he retained his full power, but lacked the intellect to utilize it properly. He could not even speak on his own, and could only follow direct orders. Within a few hours time, his brain (and cranium) had greatly grown in size, and he evolved into a being of great intellect, with a form to match. He is roughly ten feet tall, though he almost certainly can alter his physical form at will. (Defenders I#15 (fb) - BTS) - After escaping his prison at the center of the Earth (courtesy of Avengers I#111), Magneto came across a long lost cavern--"a cavern containing the ruptured remnants of a civilization that was ancient when homo sapiens were still living under rocks." Within this cavern, Magneto found a library of books, which he managed to decipher. After learning a spectacular secret, he returned to the surface, gathered an incarnation of the Brotherhood of Evil Mutants, and set up a base in the Carlsbad Caverns. From there, he began to use the secrets he had learned to grow his own mutant--the ultimate mutant! (Defenders I#15-16) - Professor X learned of Magneto's plot and, with the X-Men otherwise occupied (@ Marvel Team-Up I#23), he recruited the Defenders to assist him. The heroes located his base and managed to take out the Defenders, but Magneto then completed and released Alpha. Under Magneto's command, Alpha cast aside the heroes and then teleported the mutants out of the cavern, which Magneto had just sealed. Alpha followed the mutants to the United Nations Building, where Magneto demanded control of the world. When this was refused, Magneto had Alpha tear the UN Building from the surrounding block and lift it far into the air. The Defenders and Professor X soon arrived to fight them again, but by this time, Alpha's mind had evolved to the point that he questioned Magneto's order to destroy the heroes. Nonetheless, when Magneto commanded him, he formed an army out of concrete to attack them. When the Defenders overcame this onslaught, Magneto commanded Alpha to slay them. Alpha had no desire to take the life of another, but when Magneto told him that they were evil, he turned the Hulk to stone. In short order, Alpha had subdued Nighthawk and the Valkyrie as well, but Professor X appealed to Alpha's sense of reason, telling him that it was Magneto who was the true menace. Curious, Alpha, his head now greatly swollen, examined the very nature of all present, weighed them against each other, and determined that Xavier had been telling the truth. Alpha then age regressed the mutants into infancy, restored the UN Building, and returned the heroes to normal. Realizing that there was no longer a place for him on Earth, Alpha then flew off into space. (Quasar#14 (fb) - BTS) - Under unknown circumstances, Alpha was captured by the Stranger, who made him the subject of his experiments on his Laboratory World. He was apparently placed alongside the Futurist--an evolved human of similar appearance and ability--who had also left Earth to explore space. (Quasar#14, 15, ) - While exploring the Stranger's Lab World, Hyperion passed through the environment that housed Alpha and the Futurist. Soon after, these two, like many other of the Stranger's subjects, felt the psychic pull of the Overmind, who sent them to attack the Stranger and any who stood beside him. However, rather than follow the Overmind's bidding, Alpha and the Futurist took advantage of their newfound freedom to escape the Stranger's Lab World. Comments: Created by Len Wein, Sal Buscema, and Klaus Janson. The OHotMU Deluxe Edition#7 entry on Magneto revealed that the base found by him was actually deliberately left for him to find by Maelstrom, a hybrid Deviant/Inhuman, for his own reasons. --Thanks to TJ Burns for pointing that out.